covers, and PMG treatments of material Metheny has released outside the Group. Every effort was made to determine which was the best available version of each inclusion. as "unidentified," and 5) corrections. possible package. Charles remastered the raw tracks so that the playback volumes were consistent. He faded applause in and out. He gently and expertly reduced tape hiss. He EQ'ed, when necessary. 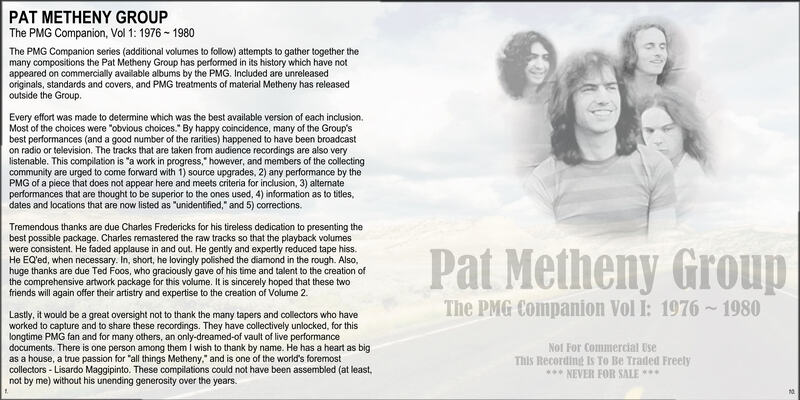 expertise to the creation of Volume 2.
longtime PMG fan and for many others, an only-dreamed-of vault of live performance documents. unending generosity over the years. community, to whom this series is humbly dedicated. 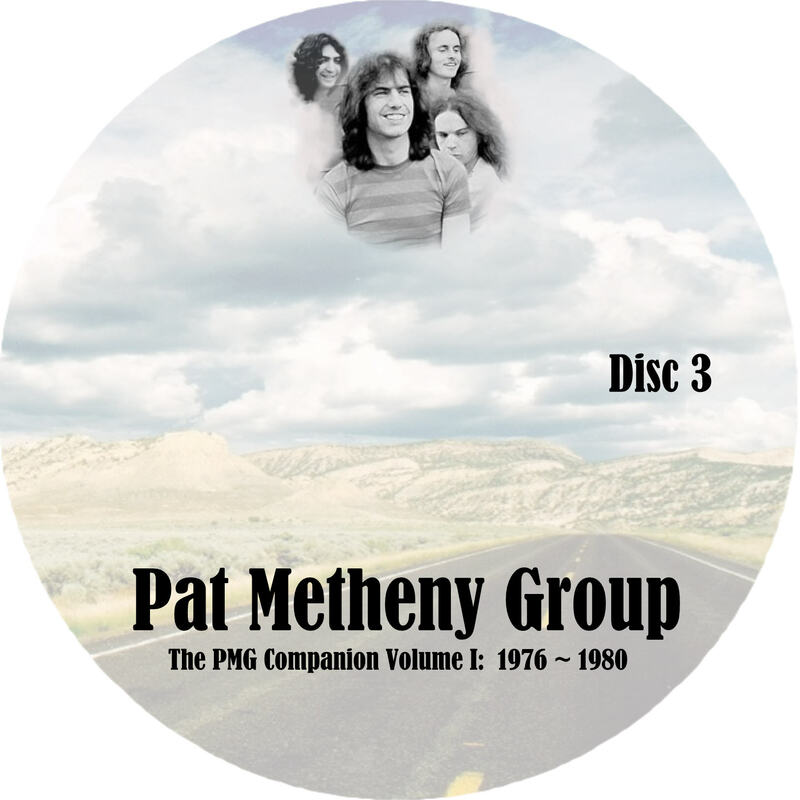 impossible not to regard these five tracks as "PMG" performances. 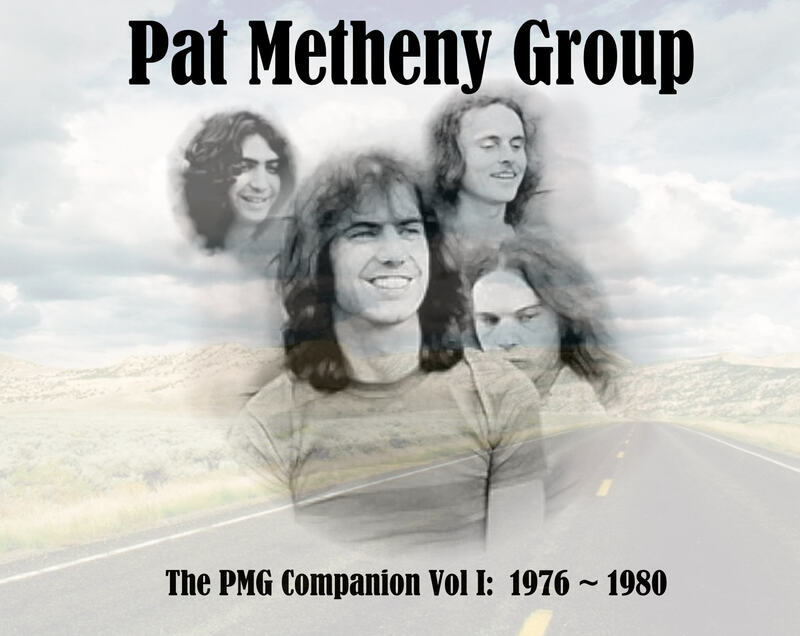 PMG was formed in early 1977, "Bright Size Life" was used to feature bassist Mark Egan. space, and each makes great use of it. in the superior source - and an upgrade is sought. which would, in turn, segue into a full-band rave-up (usually Keith Jarrett's "The Windup"). contributions to the Group during his tenure.) Note the quote from "House Of The Rising Sun." and soul favorites - during the "American Garage" era. exploratory (as a unit) in live performance than it had the luxury of being in later years. stylistic characteristics of these decidedly contemporary musicians. Here's a joyful, hard-chargin' performance of this seldom-played (by the PMG) standard. above comments regarding Unidentified #1 apply here. "variations on a theme" swirl around him. of new material generated by the inspired Metheny-Mays composing partnership. 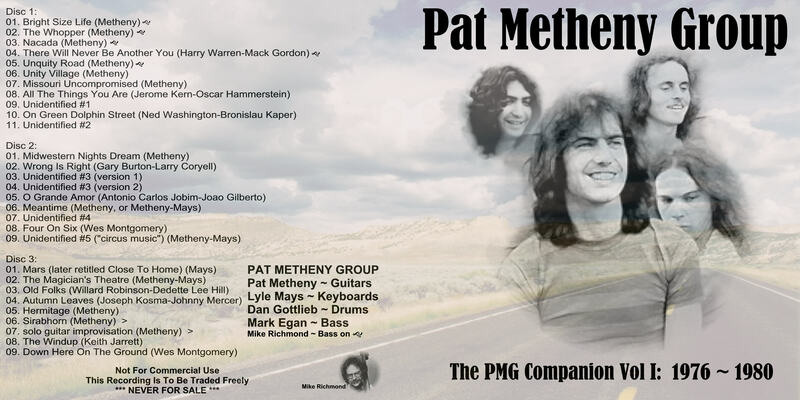 "Watercolors" or "Pat Metheny Group." recognize it as one. Even then, the material is approached in a radically different way. 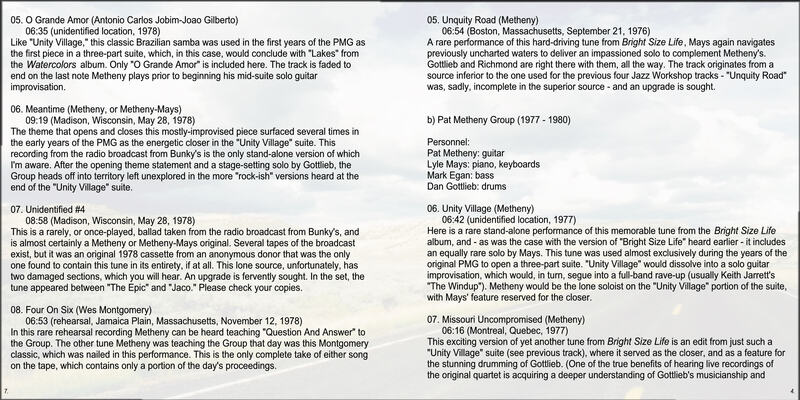 last note Metheny plays prior to beginning his mid-suite solo guitar improvisation. left unexplored in the more "rock-ish" versions heard at the end of the "Unity Village" suite. "The Epic" and "Jaco." Please check your copies. contains only a portion of the day's proceedings. 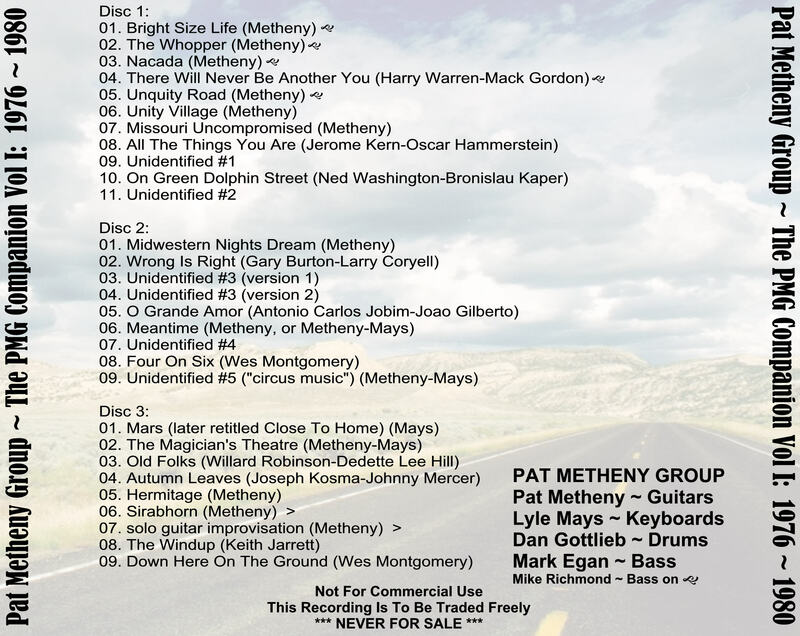 without Metheny, in shorter form, for his 1986 self-titled debut album. 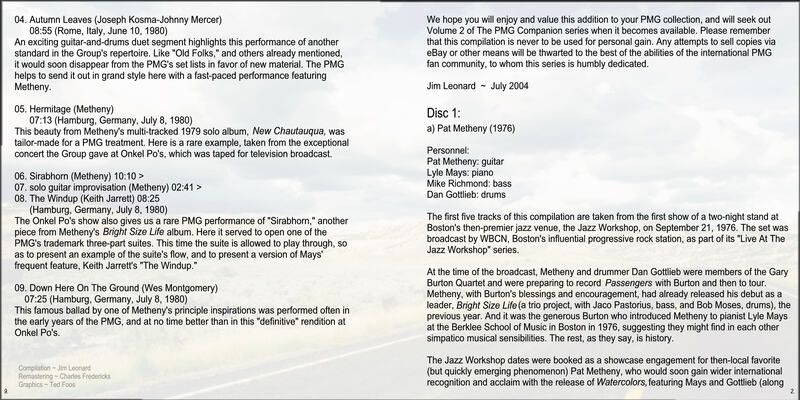 released a trio version, with Dave Holland and Roy Haynes, on 1990's "Question And Answer." 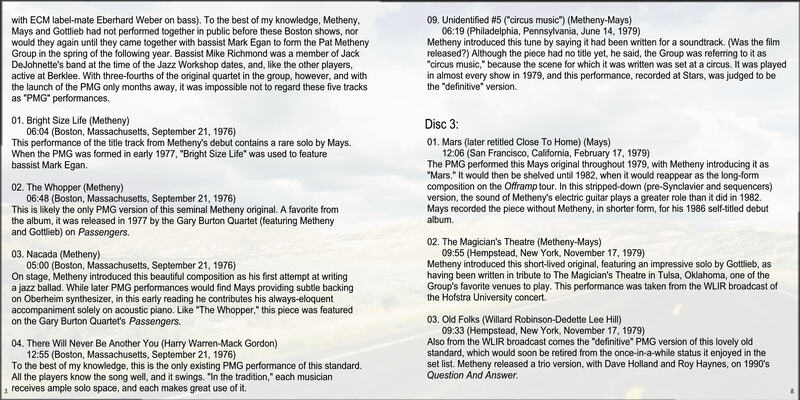 with a fast-paced performance featuring Metheny. Onkel Po's, which was taped for television broadcast. suite's flow, and to present a version of Mays' frequent feature, Keith Jarrett's "The Windup." 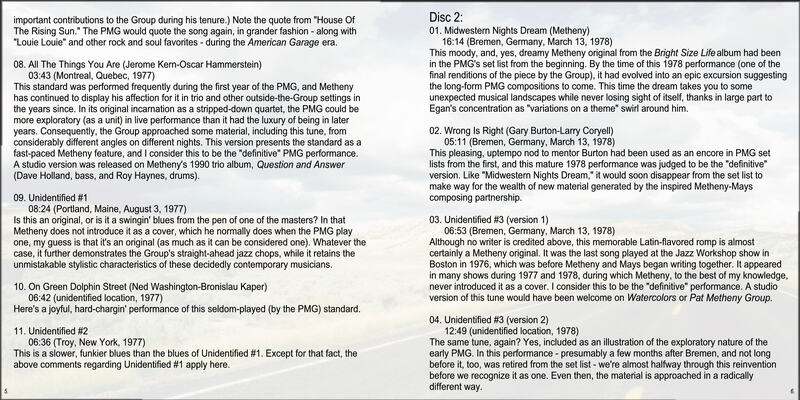 years of the PMG, and at no time better than in this "definitive" rendition at Onkel Po's.